Health is wealth. Staying healthy enables you to be resistant to the diseases in the environment, keeps one fit and active throughout the day. Prime Source Mega is a supplement that boosts the immune system which energizes the person to stay fit and lead a healthy life. Iron, Magnesium, Zinc, Copper, Manganese, Biotin, Vitamin A, Vitamin B1, Vitamin B2, Vitamin B 6, Vitamin B 12, Vitamin C, Vitamin E.
Prime Source Mega is an immunity boosting multivitamin and mineral effervescent tablet. Vitamins and minerals are essential nutrients which perform many roles in the body. 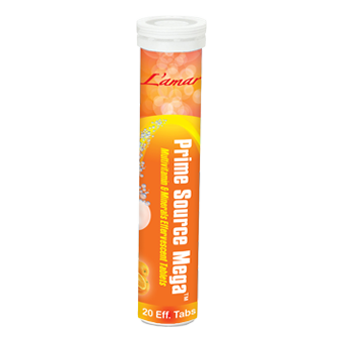 Prime Source Mega is used as an antioxidant. It is useful to heal wounds. It is also useful to build strong bones. Take the tablet orally. Either dissolve it by placing it on the tongue or put it in a glass of water and allow it to dissolve and drink all the liquid. Do not chew or swallow the tablet.